For centuries the Irish have been supreme artists in glass. It is one of the great traditions in the realm of art, a tradition founded on patient and meticulous hand craftsmanship. But the skill of Irish hands is only part of the story - there is also an uncanny power in those hands to impart something magical to glass. 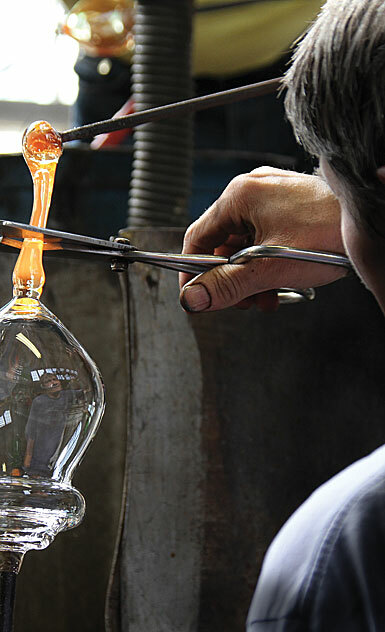 And in all of Ireland, no hands have been more patient, more meticulous, or more blessed with the elusive powers of art than the hands of Waterford Crystal's craftsmen. in the most elegant style." It was no idle boast. They had in hand the old secrets of mingling minerals and glass to create Waterford crystal of beautiful and mysterious qualities. It sang sweetly at the tap of a finger. It felt soft and warm to the touch yet possessed strength and durability known only to Waterford crystal. And it radiated a distinctive, silvery white brilliance, which Waterford Crystal's artists enhanced with deeply - cut ornamentation that gave the finished pieces a vivacious, traditional Waterford crystal sparkle. 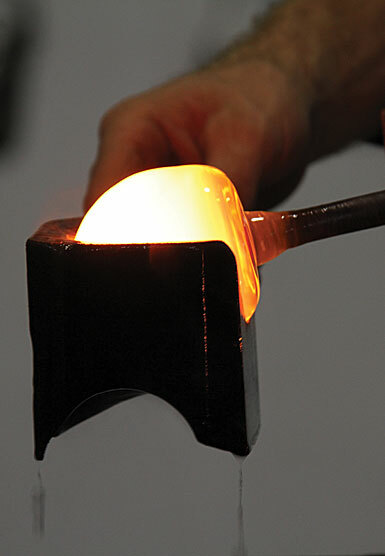 Patience, skill, and artistry had wrought a triumph at Waterford Crystal. A splendid array of drinkware, serving accessories, and decorative crystal flowed from the Glass House into the aristocratic home of Europe and America. King George III ordered a set of Waterford Crystal sent to his residence at a fashionable resort, where "it has been much admired" by court society. At two exhibitions, the Royal Dublin Society bestowed medals for superb design on Waterford Crystal's entries. Just as Waterford's art was reaching its full flower, the financial climate turned grim. In 1851 a suite of ornamental banqueting crystal was displayed at the London Exhibition to universal acclaim; and in the same year the owner, George Gatchell, was forced to close the Waterford factory, largely because of crushing taxes. This great tradition lay dormant for a hundred years. But when Irish independence rekindled a passion for Irish arts in the 1940s and 1950s, a group of businessmen resolved to bring back to life the industry that had made the city of Waterford famous. After a period of dormancy, the Waterford story resumes in 1947, when glassmaker Kael Bacik hired fellow Czech Miroslav Havel as Chief Designer for his fledgling glassmaking operation in Ireland. Havel spent many hours at the National Museum of Ireland studying surviving examples of the Penrose brothersâ€™ crystal from the 18th and 19th centuries. The traditional cutting patterns made famous by the artisans of Waterford became the design basis for the growing product range of the new company, and it is from these designs in 1952 that Havel created the now iconic Lismore , which remains the worldâ€™s best-selling crystal pattern. They recruited a small band of hand - picked artists, and under the guidance of these masters, young apprentices learned the intricacies of the art of crystal. In a few short years Waterford Crystal reclaimed its pride of place. Once more, it is the customary gift for royalty and heads of state. The Irish government has presented exquisite Waterford Crystal pieces to each American president from Dwight D. Eisenhower to Ronald Reagan. Waterford Crystal trophies are awarded for distinguished achievement in science and to the champions of some of the world's most prestigious sporting events. Waterfordâ€™s own House of Waterford Crystal Design Studio , in the heart of Waterford City, Ireland, is where the magnificent Waterford trophies, sculptures and presentation pieces are born. Under the guidance of Chief Designer John Connolly and the legacy of the late Jim O'Leary , a team of in-house imagineers craft such crystal marvels as the PGA Tour of America trophy, the Peopleâ€™s Choice Award, and the intricate panels of the Waterford Times Square New Yearâ€™s Eve Ball. New collections like Mixology, Illuminollogy, Fleurology, Interiors and Rebel Jewelry Collection are cutting a new line in the history of crystal. Click here to view the entire Waterford Crystal collection.